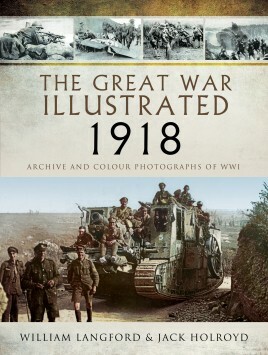 The final book in a series of five titles which graphically cover each year of the war. Countless thousands of pictures were taken by photographers on all sides during the First World War. These pictures appeared in the magazines, journals and newspapers of the time. Some illustrations went on to become part of postwar archives and have appeared, and continue to appear, in present-day publications and TV documentary programs - many did not. The Great War Illustrated series, beginning with the year 1914, includes in its pages many rarely seen images with individual numbers allocated, and subsequently they will be lodged with the Taylor Library Archive for use by editors and authors. Roni Wilkinson has worked in printing and publishing for fifty years. His published works include five fictional titles, a newspaper cartoon strip and Dark Peak Aircraft Wrecks One and Two, the top-selling guides to aircraft crash sites in the Peak District National Park (co-authored with Ron Collier).He is best known as the respected series editor and designer of the ground-breaking Pen & Sword Battleground guidebooks, of which there are now over 120 titles. He was also instrumental in the creation and development of the popular Pals series.Now semi-retired, he is actively researching and writing historical works, fictional and non-fictional, as well as contributing articles to magazines and writing reviews.He lives in Barnsley with his wife Rosalie.